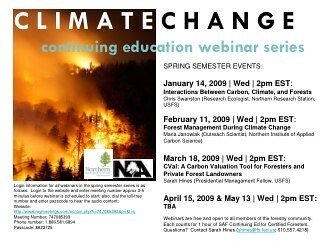 This webinar series will run from January – May 2009 and feature monthly presentations geared to help land managers, consulting foresters, and private forest landowners stay informed on the latest science and tech transfer tools related to forest-based adaptation and mitigation of climate change. Each webinar is an hour long, including Q & A, although there will be an optional additional 15 minute Q & A period. Each webinar counts as one hour of continuing education credit for certified foresters. This presentation will set the stage for a broader discussion on climate change and forests by briefly examining interactions between climate change, carbon cycling, and forest sustainability. First, we’ll cover some key mechanisms and major trends in climate change, and then explore forecasts of future climate and associated uncertainty. Next, we’ll survey the global carbon cycle and the distribution of carbon in major forest ecosystems. We’ll then consider several general ecophysiological concepts and how projected changes in climate may interact with forest ecophysiology. Finally, we’ll discuss how all these considerations may combine to affect forest carbon storage and productivity in the Lake States and Northeast. Climate change is expected to have significant effects on the condition and function of forested ecosystems; however, the exact nature of the stressors, their intensity, and the ensuing impacts on forests are quite uncertain. Forest managers will need to cope with this uncertainty, balancing the paucity of detailed information on future conditions against the demands of active and sustainable resource planning and management. In this context, sustainable forest management must recognize the need for ecosystems to adapt to changing climatic conditions in order to achieve desired objectives including, among other things, maintenance of habitat, production of wood, and mitigation of increased levels of atmospheric greenhouse gases. This presentation synthesizes available information on forest management options in the northeastern United States to provide a background for working with an uncertain climate future. This presentation will introduce participants to a just-released Carbon Valuation Spreadsheet and accompanying General Technical Report (GTR) written by Ted Bilek, Peter Becker, and Tim McCabee (2008). The spreadsheet is a powerful and valuable tool available to the forestry community (target audience: consulting foresters, state foresters) to be able to interface with private landowners and help them make sound, transparent decisions as to whether participation in the voluntary carbon market is an attractive option based on a full accounting of variables. Click here to download a poster version of these details. I just learned about an excellent, family oriented conference at St John’s University in Collegeville. The conference is all about sense of place, taking care of the land, and being outside as a family. With a baby due Jan. 20 I probably won’t make it, but I hope you can! On Saturday, January 24, shake off the winter chill at the 2009 “Living in the Avon Hills” conference at Saint John’s University in Collegeville, Minn. Award-winning author, naturalist, and wildlife photographer, Stan Tekiela will give the keynote address. The rest of the day is filled with speakers on topics of natural history, land-use, the arts and more. Bring the kids for sessions designed for them. At $15/adult and $5/child, this is an event you won’t want to miss. Register now! 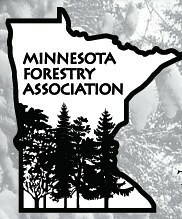 The Minnesota Forestry Association is offering a “Five-event Weekend” at the Cloquet Forestry Center on January 9 and 10, 2009. The weekend includes workshops on mapping with GPS and teaching kids about forestry, a lumberjack dinner, local MFA chapter meetings, and the annual committee conclave. The event will be a great opportunity to learn, have some fun, and give a bit of your time to a committee that interests you. Don’t miss it! October 16, 2008, was a beautiful fall day as approximately 45 landowners converged upon the Plymouth Creek Civic Center for the fall landowner tour. The gardens at the civic center were something to be admired. The fall blossoms and extensive landscaping was a welcome sight in the middle of the city. 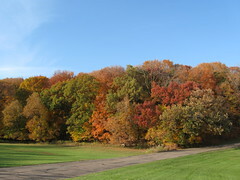 Big woods in the fall. Photo by Mark Ellison, MN DNR. Tour organizers and DNR foresters, Art Widerstrom and Alan Olson, welcomed the group and we excitedly boarded a tour bus to visit several sites within Hennepin County. The first stop was at Doug Dayton’s property. 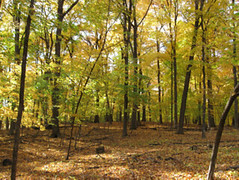 His diverse property supports both a 90-acre prairie and a 20-acre stand of big woods. The prairie was planted and is being managed by Prairie Restorations using prescribed fire. Stephanie Jenniges, Land Management Coordinator, from Prairie Restorations spoke about prairie management, some of the plants, several invasive species and the need for this site to be burned periodically to maintain a healthy prairie. 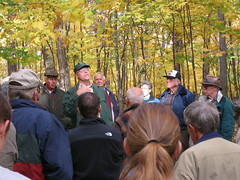 Alan Olson took the group on a hike through the woods to see a prime example of a big woods forest. The massive oaks, basswoods and maples form a dense canopy, which limits the amount of brush and undergrowth making the walk through the woods a very enjoyable one. Walking up the hill on this warm fall day, hearing the leaves rustle and crunch beneath our feet, made it seem like we were deep in the north woods. Alan Olson, MN DNR. Photo by Mark Ellison, MN DNR. The next stop was in the city of Minnetonka at Purgatory Park. Our tour guide for the park was Janet Van Sloun Larson, Natural Resource Specialist for the City of Minnetonka. This area includes a wetland that the settlers could not utilize for agriculture, thus it later was developed into a park. The park is very popular for walking dogs and offers citizens an escape to a natural area within the city. It was interesting to listen to Janet discuss how they are re-claiming the area by eradicating buckthorn. Several techniques for eradicating buckthorn were discussed and we got to see first-hand the results of several extensive buckthorn removal sites which were managed with the help of volunteers. Stephanie from Prairie Restorations discussed the utilization of prescribed fire techniques for managing prairie and also discussed how fire can be used to re-establish a historical prairie, such as the one that was discovered in this park. The group got to see where this prairie was discovered and heard how park staff, with the help of Prairie Restorations, used prescribed fire to re-establish the original prairie that was present when the first settlers arrived. 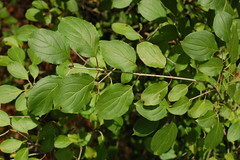 Common buckthorn leaves. Photo by Eli Sagor. Our tour continued into the Scenic Heights Elementary School Forest, where a local teacher, Dawn Christesen, School Forest Coordinator, has utilized the forest for education of students and other volunteers. They have done a massive buckthorn removal project and have continued to work with Alan Olson to manage the forest and rid it of invasive species. They have planted seedlings within the school forest utilizing Arbor Day seedlings from the State Nursery. There is also a small wetland that is used by the science department to teach lessons on water biology. Using volunteer help, a shelter was built on the property where classes meet to discuss lessons learned at the outdoor learning center. The local Boy Scouts have been assisting with the buckthorn removal program as one of their Eagle Scout projects. This forest is really integrated into the community. Oak foliage during fall color. Photo by Mark Ellison MN DNR. Next, we proceeded to visit a direct seeding project conducted by the City of Plymouth. City forester Paul Buck spoke with those on the bus regarding the direct seeding procedure and the results of this practice. Seeds were collected locally and the site was ripped and tilled. Fifteen five-gallon buckets of seed were spread by hand and the site was covered with wood chips. The planting has had good survival with very acceptable stocking levels. The planting primarily consisted of black walnut, butternut, bitternut hickory, red and white oak. Cottonwood, poplar, willow and buckthorn that seeded-in have been removed to maintain the original planting. Our group returned to the Plymouth Creek Civic Center to enjoy a wonderful meal and hear some presentations. 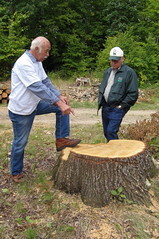 Gary Michael, DNR Private Forest Management Coordinator, spoke about the new 2C managed forest land tax program. He covered the requirements to be eligible for the program and made comparisons with the SFIA and green acres tax programs. Tamara Martin, Ecologist from Top-Notch Urban Ecosystems, gave an informative presentation on invasive species. She brought several samples of invasive plants, discussed how each degrades the environment and recommended eradication techniques that have shown the best results. 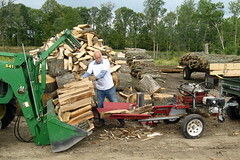 Neville Wilson, DNR Central Region Plant Health Specialist, covered the emerald ash borer. He discussed what to watch for in your forest to identify symptoms of emerald ash borer and he also showed samples of the insect and discussed strategies for slowing its rate of spread into our forests. Alan Olson and Art Widerstrom wrapped up the evening with a big thank you to all who participated.